A quick list of don’ts!…. Don’t just hire anyone that says they do SEO. I have seen about 50 sites in my town offering SEO, but when you look at what they do it isn’t SEO at all. Sticking keywords somewhere is NOT SEO! Experts vs. Non-Experts – Be careful who you invest in! Anyone can say they are an expert at anything, but that doesn’t make it so. What makes an expert? Not someone that offers 20 services plus SEO! With target marketing, online and off, know how to influence people and change how they search! Have full knowledge about recent changes in the industry and with the big Goog. Should be concerned about the coding of your website. Don’t hire a friend that thinks they know social media because they have more than 1,000 followers on Facebook. This is not a social media expert. This is someone that ran around becoming friends to have friends. Same goes for Twitter. If they have 5,000 followers, but are following 4,980 people they have followers because they follow. The odds of getting detailed and informative information is minimal! Therefore these people, in my opinion, are not experts! Don’t hire someone that says they can handle your social media, but never mentions or asks about your goals. Don’t hire someone that doesn’t know about how to track social media successes or failures. 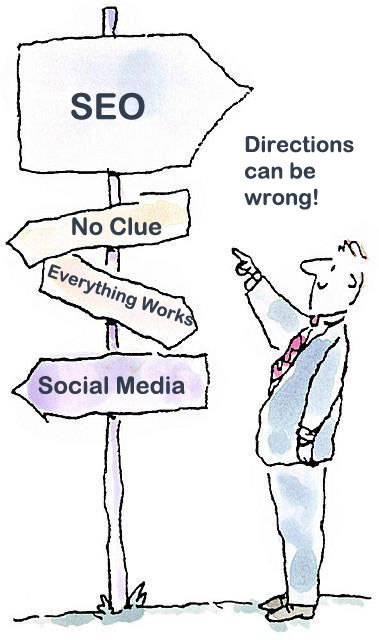 Don’t hire someone that doesn’t research or tie together your other online marketing with your social media campaign! Someone buying a list and emailing people doesn’t equal success. This is a waste of time and money. Don’t hire a company that will share your email list with your competitors. We see this locally especially in real estate. Use a service and they take your list and start sending all your competitors emails to your list. Don’t take the time to email people and then offer them nothing but salesy crap. People hate that. Offer them something and subtly sneak the sales info in there. Don’t hire just anyone to create your website. This is one area you want to spend money and ensure that your web presence is attractive and strong. Don’t ignore local search or hire anyone that says it isn’t important. If your company gives you a “website” don’t just assume it will become successful. Lots of work to be done there. If you are in an big industry where everyone is being told at conferences or by employers to market online the same exact way you have no shot at doing well. Be different. Be focused on informing your audience, increasing web presence and converting. Don’t ignore online video marketing. You need it! Don’t trash blogging. The benefits, if done right, are endless! DO NOT buy canned content for your site. I still see it. Look up “duplicate content”. Do not hire an SEO consultant that can’t answer questions. Google them! See what people think of them. Actually read their site and blogs and compare them to other SEO sites and blogs. Do they seem updated? Intelligent? Knowledgeable? Look at their clients, then google what these clients offer online – services and locations. Do they show up? Can you only find them for their business name? Look at the their clients sites…are they aimed at conversion and trust? They should be.